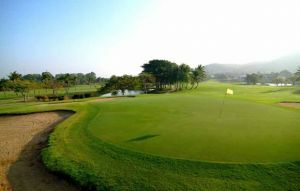 The course is renowned for being presented to exacting standards and the greens are built and maintained to SGA standards. 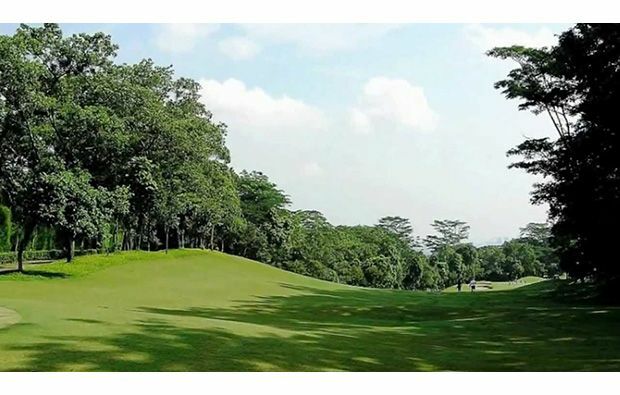 Set in the grounds of the Sentul Highland residential development the course winds its way through some of the architecturally mind-blowing and luxury houses on the development. 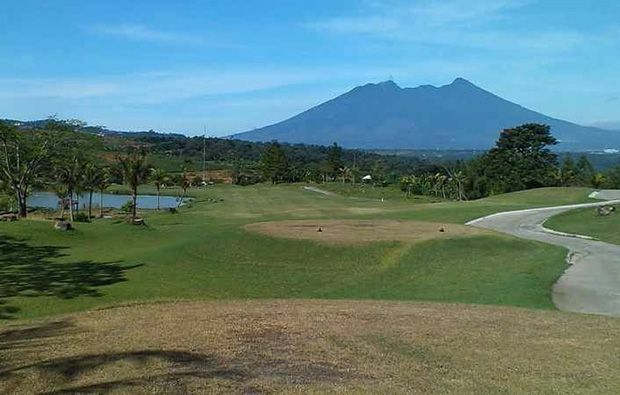 Sentul Highlands Golf Course has been designed to test every level of golfer with five tee positions for each hole to accommodate for all skills levels and abilities, but it is Player´s attention to detail that sets this course apart. Player has created a magnificent test of golf, and with holes that epitomize a Player design the course will live long in the memory of all that play it. Of the most memorable holes, the fourteenth and the hole pays tribute to Player´s imagination. Downhill from the tee, the drive must avoid the rocks and boulders that litter the very narrow fairway. The second is slightly easier than the tee shot played downhill with a mid-iron to the well protected, small undulating green. The hole is not long, but challenges the golfer at all times. Most notable on the front nine must be the long par 4, 5th hole, which requires a long well struck tee shot to the right side of the blind, narrow fairway to give you the chance of hitting the green in regulation. The second shot is no easier, uphill to the elevated green protected to the front left by a deep bunker. Taking enough club to avoid coming up short is vital if you want to walk away with a par. The par 3 twelfth is stunning, absolutely stunning and at just 140 yards it would appear to be a chance for a certain par. 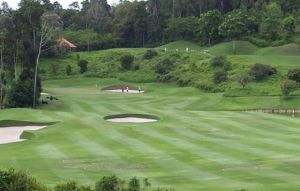 But not be fooled in to thinking it will be an easy par, boulders scattered across the fairway and a heavily guarded green will test the skills of the best golfers. 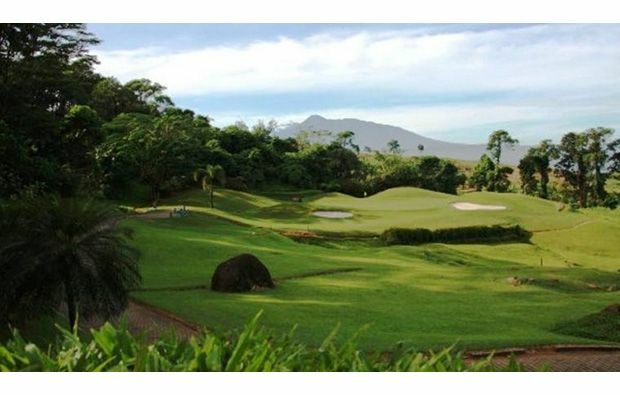 It has a fantastic backdrop and is visually one of the nicest holes on the golf course. The clubhouse is simple in design but delivers in quality service and amenities. From a well stocked pro-shop to the spa and locker rooms the clubhouse has everything you need. The cuisine is sublime, with traditional local food, as well as international cuisines being served to the highest standard. 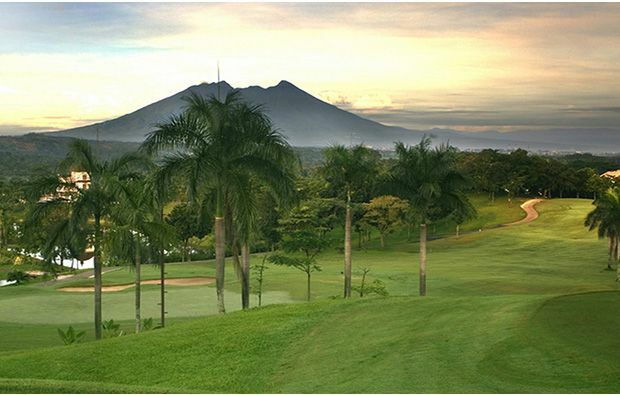 You can enjoy the terrace with an iced beverage to end the perfect day of golf at a superb golf course. 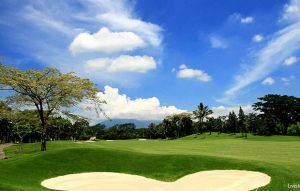 Like many golf courses in Jakarta Sentul Highlands Golf Course is heavily booked at weekends so much better to book a tee time on a weekday. 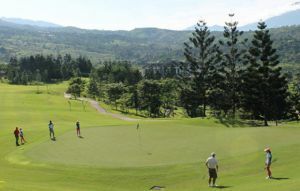 Sentul Highlands Golf has different Services to offer. Choose a date and number or players to see the rates.